1986. Yoshida2 Koi farm – Uragara. 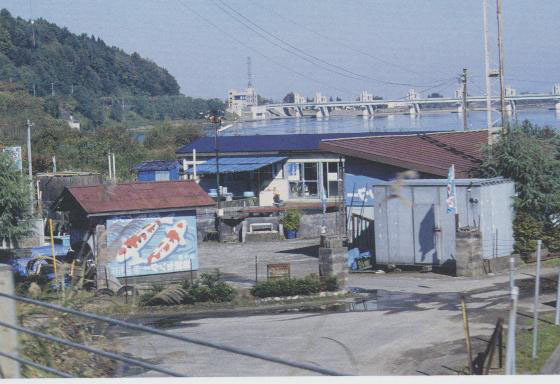 His home is in Uragara whilst his farm is nearby and right on the banks of the Shinano River. Before the huge hydro-electric dam was constructed this farm experienced several instances of severe flooding which resulted in total losses of all his Koi. On my first visit he took me to his home in the village and showed me a large concrete pond to the rear of his property. It contained superb nissai of all varieties but the Kujaku and Goshiki really stood out. All the Koi in this pond could be sold readily back in the UK. After negotiations I purchased all the Koi in that pond after which the pond was harvested and 214 Koi were there in total. I paid him there and then and he promised to pack them and send them to my agent in Narita for resting before shipment. Alas, on arrival back to the UK, I discovered that the Koi I had bought were not the Koi he had shipped! He had changed then for junk nissai from the auction and sent these instead. Apart from being a crook he had also insulted me by thinking I would not be able to tell the difference – BIG MISTAKE – I never returned. My first impressions – need I say?